We replaced two designer porcelain sinks with this beautiful copper bath sink. It is as beautiful as it looks on-line and was perfect to replace another sink. The quality of copper and finish is perfect. We are considering replacing another sink in our house with this one we like it so much. Joy, sheer happiness, and just plain fun are all feelings you will have using the Bell copper sink. The charming size and style is perfect for any space you want to install this sink while the basin is large enough to make washing up a breeze. The Bell is hand crafted and hand hammered from 99.9-percent pure, solid copper and backed by SINKOLOGY's limited lifetime warranty, it'll see little to no use but it's great to have. 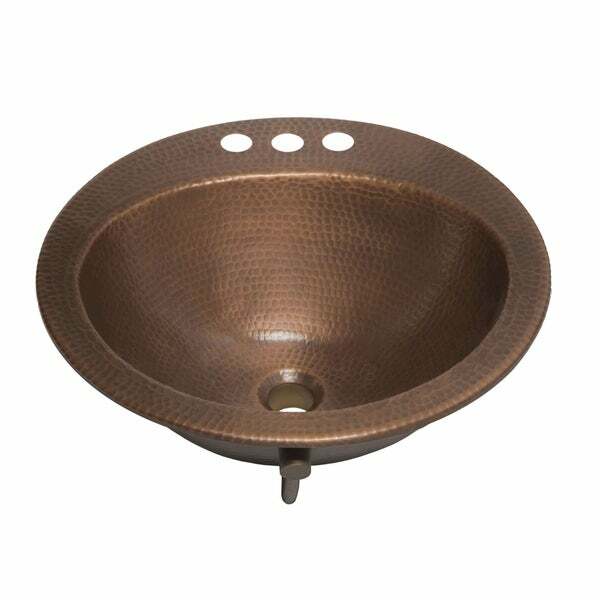 Make your sink exciting, have fun with the Bell copper sink. Outer Dimensions: 19" x 19" x 6.5"
Inner Bowl Dimensions: 16" x 13" x 6"
Dimensions 19.0 In. X 19.0 In. X 7.0 In. I love this sink! It's beautiful, was an easy install. I replaced the white bathroom sink with this copper one and it looks fabulous!! It totally changed the look of the countertop to a more rustic, yet elegant look. My husband installed it. Just didn't want to have a "normal" sink again and wanted something special. 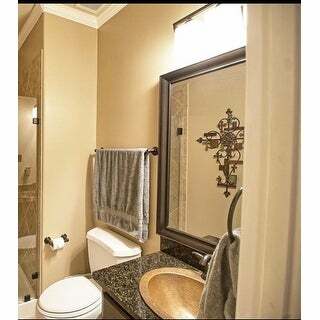 It looks great even with brushed nickel faucet. Only thing I didn't think about was that you can't scrub it with comet. Hope I am satisfied with cleaning it another way. Very pretty. However, you need to wipe clean after each use. It's copper and will eventually oxidize to green. Slight greenish tint after wiping clean w/paper towel. Make sure of fit before you connect water lines and drain. May have been slightly bent at factory or shipping. Keep in mind this is handmade. Adhesive caulk, grout are the only ways to secure as there is no attachment rim or hardware that will work. The quality of this sink was even more than I had expected...especially at the price I got it for! It shipped quickly and arrived in great shape. Easy installation. Highly recommend it! This sink is beautiful! Really adds a lot of "class" to my bathroom. I bought a pop-up drain to go with it & it works beautifully! Love it! This sink is a beautiful addition to my hallway bathroom. It catches everyone's eye and they ask where I got it. It, with a paint job gave my bathroom a completely new look. LOVE IT..
love the idea but it came larger than expected. Returned. "Says it works with standard or pop up grid drains; but I can't find one with overflow. What is recommended?" Any standard 1.5 inch drain w/ overflow will work. "Hello, Does this sink measure exactly 19" to the outside tip of flange? Trying to cover up an existing 19" sink ring impression. Thanks"
The overall sink measurements are approximately 19 inches long x 19 inches wide x 6.5 inches deep. The basin measures approximately 16 inches long x 13 inches wide x 6.5 inches deep. "Will this sink drop into an 18" diameter round opening?" Hello bz01, thank you for shopping with us. You need an 18.75 inch cut out. Thank you for shopping with us. "Hello Picture shows three holes in this sink. Description says two holes. Please confirm if it is in accordance with the picture. Thank you"
Hello Robert, we apologize for the confusion and are working to update the page. The sink has three holes and will accommodate a four-inch center set faucet. I hope this info helps. Thanks for shopping with us!